Combine the syrup, gin, vermouth, and ice in a cocktail shaker. Shake until you can’t shake anymore! Pour equally into two martini glasses. 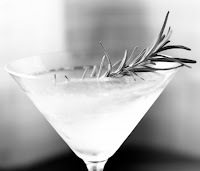 Garnish with the rosemary sprigs. Combine the sugar, water and chopped herbs in a small, heavy saucepan over medium-high heat. Stir over the heat until the sugar is dissolved and the mixture begins to form a syrup like texture. Pour into a small glass dish and allow to cool. Friday, October 23, 2009 6-10 P.M.
"The Wagyu Beef" - also known as "Kobe Beef" is the ultimate masterpiece of Japanese Beef. Wagyu are raised with pride and care all over Japan, and they provide truly world class high quality beef. Wagyu is strictly graded and sorted info five classes by professionals from the Japan Meat Grading Association from A 1 to A 5. A5 is the highest grade of Wagyu Beef. One of the most important factors for grading beef quality is "marbling", which refers to the fine white streaks of fat that run through lean beef and enhance flavor and tenderness. "The Wagyu" has excellent marbling that puts it among the world's top class. Furthermore, the fat in "The WAGYU" melts at just 77F (25C), a lower temperature than any other beef. This explains why "The WAGYU" melts in your mouth for a sensational burst of flavor from the very first bite. A fresh chilled beef program from Japan to the USA. Traditional Wagyu Beef, also known as Kobe Beef, is a legendary delicacy of Japan. The meat from Wagyu cattle is known worldwide for its marbling characteristics, increasing the eating quality through a naturally balanced flavor, tenderness and juiciness. Wagyu Beef is so well marbled that it exceeds the marbling charts in any other country and is known for its intense white fat marbling that rivals Foie Gras in richness and flavor intensity. It is said that the Wagyu Cattle is fed a diet that includes Beer and or Sake to aid in digestion and induce hunger during the humid seasons. This practice has no effect on the flavor but along with daily massages to prevent cramping from lack of exercise in the rugged Japanese terrain does aid in the superior marbling that Kobe is known for. Expect a more low-key, family-friendly event out at Quail Lodge this week when Coastal Luxury Management trades Michelin Three-Star chefs for farmers, winemakers and local restaurant chefs who are stars in their own right. 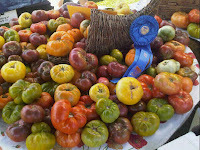 Unlike the Carmel TomatoFest of past years, the fledgling Harvest: Farm-to-Table event will be held over two days, and will expand beyond the heirloom tomato — yet the cost is about the same ($85). There will be some glitz and glamour (how could there not be with David Bernahl at the wheel?). 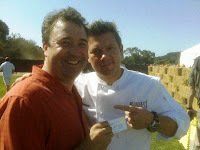 The Food Network's Tyler Florence will be a kind of master of ceremonies, bringing his family down from the Bay Area. 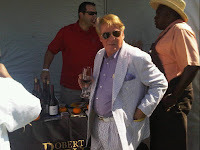 "Top Chef" reality star Stefan Richter, so funny and brash and talented (he kept us all entertained during an after-party at April's Pebble Beach Food and Wine), will roam the grassy field in search of wine and pretty women, I'm sure. 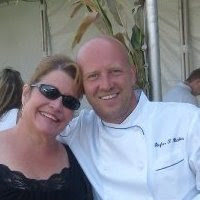 And our own "rock star" chef, Cal Stamenov of Marinus, will be on hand lending credibility to this corner of the culinary world. This market has slipped even further today as growers attempt to stir up type of demand they can find. Many suppliers have started the week with good supplies, and are looking to move load volumes. Pricing continues to be competitive in both the Santa Maria and Salinas growing regions. Supplies look to be good throughout the week. Also buyers continue to have alternatives points of availability including, Washington, Canada and Mexico. Availability of both romaine and romaine hearts has improved dramatically. Issues continue to exist with some lots having issues with fringe burn. Suppliers have indicated the fringe burn problem this week will be less an issue compared to previous weeks. Green and red leaf is stable as we head into the weekend shipping. Most suppliers are expecting good availability on leaf items throughout the week. The summer production season will conclude in about two weeks for areas in the Midwest that include Ohio, and Michigan. Things here are mostly stable. Most suppliers have started the week with moderate to good supplies on both bunched product and crowns. Slightly better pricing can be seen out of the Santa Maria region but prices are firming up. This market looks to get stronger towards the end of the week. The quality of the product continues to be good. Alternative availability is out of Maine, Canada and Mexico. This market has not changed from the previous week. Supplies are strong, mainly on twelve sizes and deals can be made on volume orders. Supplies may fall off towards the end of the week. Santa Maria and Salinas continue to be the main areas of production. Pricing is competitive in both areas. Production this week is starting low with multiple challenges. Quality is the factor of declined production as shippers are leaving a good portion of fruit in the fields. The weather forecast is calling for a warming trend to set in starting today with temps reaching into the mid to high 80’s. The increased temps right after the rain is a bad combination, further stressing the fruit. We can expect to see softer, over ripe and bruised fruit. Oxnard is right around the corner with new crop that should provide some relief for availability and certainly better quality. Raspberry production has tightened up a little, but quality remains good. 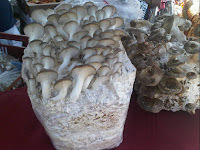 There is Californian production in Watsonville and some in the southern areas. We can expect some light production out of Oxnard by the end of September. Oregon and Washington are done, Northwest shippers will are using Controlled Atmosphere fruit. There are still good quality and supplies in Michigan. Things are becoming tight and we can expect this trend until we start to see the offshore fruit arrive around late September. We can expect to see higher fobs. New crop Norkotahs are going strong with good quality. There are some Ranger, Western and very light supplies of Burbanks available. Depending on the shipper there are some that are into larger product and some are now into smaller Norkotahs which has leveled out the prices. Washington new crop Norkotahs are going strong with good quality and availability. Colorado is going strong with new crop supplies as well. Northern California has finished up for their season. Southern Washington is going with good availability on reds and yellows. Mount Vernon, Washington with good availability this week; product quality as usual is stellar. Supplies are abundant but the sizing is on the small side. The maturity levels on Chilean fruit are good. The fruit continues to struggle with maturity levels. The Mexican avocados are showing early season characteristics that will take longer to ripen. The Michigan and New Jersey deal is finished on cucumbers but Georgia and Tennessee are into good volume with excellent quality. Minimal demand will keep the market down for another several days. Baja’s production remains very light. Fresno now looks to start by weeks end. Washington will have steady supplies into next week. Market may rise due to a shortage in the east. through that area may lead to issues later next week. steady over the next couple of weeks. San Diego continues crossing decent volume now but demand is eating up most open fruit. Reports of Baja quality have been good. It has stabilized and we are seeing consistent pricing. We can expect reduced volume from Baja by mid to later October due to the recent Hurricane that past over Baja. Roma tomatoes have tightened up a bit. The contributing factor to the tighter supplies was the recent rain the valley received keeping growers out of the fields for two days. We can expect higher fob’s on all tomatoes. Large Egg (Northeast Market) gradual increase Current: Wednesday Market: Large is up .02 in the NE; SE and South Central are unchanged; Up .01 in the MW from previous week. Medium is up .02 in NE, SE, MW and South Central from previous week. XL is up .01 in the NW and unchanged in the SE, MW,and South Central from the previous week. Thursday Market: XL is unchanged from previous week. Large is unchanged from the previous week. Medium is up .04 from previous week. FMO Base Skim Class I steady The Federal Milk Order base Class I skim milk price released for September is $8.74. Georgia Dock steady Continued over supply of small birds versus demand. NE Wings gradual increase Some strength the next few weeks. Historically we have seen a dip in Oct. that may or may not happen this year due to production cuts and demand. Will trend upward again in Nov.
NE Jumbo Wings gradual increase Some strength the next few weeks. Historically we have seen a dip in Oct. that may or may not happen this year due to production cuts and demand. Will trend upward again in Nov.
NE Tenders steady Some increased demand should support this market for the next few weeks, then a gradual decline. NE Small Tenders steady Some increased demand should support this market for the next few weeks, then a gradual decline. NE Boneless Thigh Meat Special Trim steady Temporary floor had been reache as the price is low enough to dlear product. Boxed Beef Cutout, Choice steady Cutout values are expected to remain generally steady with some spot market trading to occur designed to keep inventories rotated and moving. Boxed Beef Cutout, Select steady Cutout values are expected to remain generally steady with some spot market trading to occur designed to keep inventories rotated and moving. 81% Lean Fine Ground Beef steady Ground Beef is steady but will trade at the end of the week to clear up inventory long suits. Inside (Top) Rounds - Commodity Trim, Choice steady The market value of Inside Round has stalled and will adjust slightly lower during the next 2 weeks. Inside (Top) Rounds - Commodity Trim, Select steady The market value of Inside Round has stalled and will adjust slightly lower during the next 2 weeks. 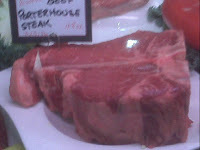 Heavy Lip On Rib Eyes, Choice price increase The Rib complex is an area packer's need to see market appreciation. While the market is steady today higher prices are forthcoming. Heavy Lip On Rib Eyes, Select gradual increase The Rib complex is an area packer's need to see market appreciation. While the market is steady today higher prices are forthcoming. 5/up PSMO Tenderloins, Choice steady Tenderloins are not gain pricing momentum. Packer's continue to use price to drive sales and rotate inventories. Like the Rib Eyes, packer's will look to the Tenderloin need to move higher. 5/up PSMO Tenderloins, Select steady Tenderloins are not gain pricing momentum. Packer's continue to use price to drive sales and rotate inventories. Like the Rib Eyes, packer's will look to the Tenderloin need to move higher. 0X1 Strip Loins Boneless Strip Loins, Choice steady Strip Loins continue to display weakness. Neither Foodservice or Retail support is available. 0X1 Strip Loins Boneless Strip Loins, Select steady Strip Loins continue to display weakness. Neither Foodservice or Retail support is available. Heavy Top Sirloin Butts - Commodity Trim, Choice steady Top Sirloin Butts will move slightly lower now that the summer grilling season has past. The market should remain steady at lower money through years end. Heavy Top Sirloin Butts - Commodity Trim, Select gradual decrease Top Sirloin Butts will move slightly lower now that the summer grilling season has past. The market should remain steady at lower money through years end. Tri Tips, Fat On, Choice gradual decrease Tri Tips will move lower as west coast retailers concentrate Pork, Poultry and other more seasonal beef cuts. Outside Skirts, Commodity Trim gradual decrease The Outside Skirt is showing signs of weakness. Inventories are starting to build at the packer levels forcing downward price adjustments. through 26-30 count and some further discounting is noted." lower offerings noted as remaining inventories are cleared." discounting noted in order to spur buying interest. Peeled tail"
Head-on shrimp are steady to full steady, supplies related tight. to meet Latin off erings"
Cod steady Cod inventories are very good in all sizes across the board and much more affordable this year than last. There are still some scattered landings in the Gulf of Alaska. some downward pricing pressure in the Northeast market. noted. Some carried product is also reported to be in the market. adequate for a fair demand. looks to trend between 4.35 and 4.55 for 3-4 pound d-trim fi llets. European portions are noted between 5.50 and 6.00. 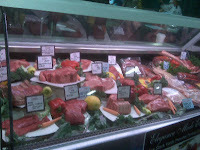 The Chilean fillet market weakened on 3-4 and 4-5 pound fillets. steady for a fair demand. 1-2 supplies remain barely adequate. The Chilean wholefish market is steady at listed levels. market is steady at listed levels. market is about steady for a quiet demand. about steady to barely steady on 20-24 and 20-up crab. and importers adjusting offerings based upon replacement. Domestically, availability of U10’s is thin and market prices firm. Description: Cloves are the dried, unopened buds of a small evergreen tree. Their flavor is warm, pungent, spicy and sweet. Available in whole and ground form. The main part of the clove plant is its bud. Clove oil is extracted from these buds, but it can also be extracted from its leaves. However, it is the clove buds that are used for cooking purposes and not the leaves. The clove comes from the Myrtaceae (myrtle family). It is a distinctive species that has a pleasant smell. The clove on its own has quite a strong aroma. When you taste it, it has a burning flavor. The reason for the strong smell and taste is its contents. Essentially, its oil is the chief content. Up to 15% of the clove content may be oil, and of this quantity, eugenol makes up 70 to 85%, eugenol acetate makes up 15%, and β-caryophyllene makes up another 5 to 12%. This comes to around 99% of the oil, while another 1 or 2% is made up by triterpene oleanolic acid. The clove has been known by different names in other languages. In Spanish it is called clavo, in Catalan it is called clau, in Portuguese it is called cravinho, and in Tagalog it is called clovas. These names are thought to have been derived from the Latin name clavus, which means “nail” due its shape resembling a nail. It is thought that this name made its way into English through Old French with the name clou. In addition to this, it is thought that the name clove is related to the verb cleave that refers to what use you may have for a nail. The clove has been an ancient spice popular in Europe, Northern Africa and Asia. Trade between China and the “clove island” Ternate dates back 2500 years. The ancient Chinese used cloves for deodorization. Arab traders are known to have brought cloves with them to Europe when the Roman Empire was in control. At that time, however, cloves were very expensive. Zabaglione is a whipped custard made with egg yolks and sugar gradually diluted over heat with Marsala or other wine, fruit juice, or liqueur. This recipe calls for Marsala. Combine 1/2 cup Marsala, honey, 1 tablespoon butter, rind, and 1 teaspoon spice mixture in a small saucepan. Heat over medium heat until butter is melted. 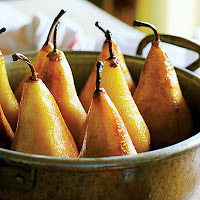 Place pear halves, cut sides up, in a 13 x 9-inch baking dish coated with cooking spray. Pour Marsala mixture over pears. Bake at 350° for 30 minutes or until pears are tender, basting occasionally. Remove from oven; keep warm. Combine 6 tablespoons Marsala, 1/4 cup sugar, water, salt, and egg yolks in a medium, heavy saucepan, stirring with a whisk. Cook over low heat, whisking constantly, until mixture is thick (about 5 minutes). Stir in remaining spice mixture and 1 teaspoon butter until blended. Place 1 pear half in each individual bowl. Spoon 1/4 cup sauce over each pear half. Garnish with lemon zest and nutmeg, if desired. Serve immediately. SAN FRANCISCO – September 17, 2009 – U.S. Foodservice-San Francisco, the only green-certified broadline food distributor in the state of California, partnered this week with several Bay-area organizations to showcase ways in which companies can maximize green business practices. U.S. Foodservice joined the Bay Area Green Business Program, StopWaste, and Pacific Gas & Electric at its 2009 Fall Food Show at the Alameda County Fairgrounds. to offer businesses tips on the best green initiatives to fit their needs. • Partner with utilities (such as PG&E), which offer incentives for business owners who curtail their facility energy use during times of peak demand. This helps the system better weather peak times while reducing energy costs. • Encourage employee participation with commuter incentives. Initiate a vanpool or provide preferential parking for carpooling participants. • Use recycled, biodegradable, and compostable paper products. Try reusable mugs instead of paper cups. • Replace older appliances and technology with new Energy Star-compliant units. • Consider alternate lighting options. Today’s energy-efficient bulbs produce the same amount of light, but use less energy to do it. • Landscape with drought-resistant foliage. • Recycle water from refrigeration units. U.S. Foodservice-San Francisco also offers green business tips to its customers through its toll-free Green Business Hotline at: 1-800-682-1228, x353. 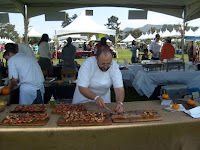 U.S. Foodservice-San Francisco received green certification from Bay Area Green Business in May 2007. This designation made the company the first green- certified broadline distributor in the country and the only one in the state of California. The first opportunity to make a good impression happens with recognition. All you have to do is say hello. Nobody likes to be ignored. If you're busy, ignoring the customer won't make them go away, it'll just piss 'em off. Just say "I'll be right with you" and they'll relax knowing "you'll be right with them". - give them bread and butter or nuts or whatever you have at hand to give them, even if it's only the beer or wine list, and toss in another "I'll be right with you". Even if you can't get to them right away, making them think you'll be right with them is a far cry better than ignoring them. The only thing you have to worry about now is saving your tip! Don't give these things to the customer all at once, but space it out little by little so customers know they're not being ignored. As long as you "touch" them, you can buy a lot of time. Again, if you do nothing, and there will be nothing you can do to improve their first impression. 3. Shaker Cans ~ Time to get flashy! NEVER toss ANY amount of drink down the drain! Ice of course is fine, but no liquid. The only draining that shold be going on is the entire draining of the shaker can into my glass. The next draining is the contents of the glass into my thirsty booze trap. If I'm paying for booze, I want it in MY pipes, not the sink's. The best way to learn measurements is to fill the the glass you're going to serve the drink in, to a level about 1/4" to 1/2" below the rim then add it to the shaker glass, not the shaker can, and remember that mark. LEARN where your "marks" are. Different glasses are different sizes, do the same the same for each glass, build your repertoire and impress people with your "to the drop" technique. It's easy as hell but people still marvel when I hit my marks, "how did you DO that?!?!" If you accidentally end up with too much in the can, strain the drink into a glass first, then top it with as much ice as will fit. Short? Add ice. Customers don't like watching you add ice to their drink, so hit your mark. The other reason to add more ice instead of more mixer is because addine more mixer waters the drink down and throws your proportions off. SLIGHT heap over the rim. By the time you get the booze in there, the ice begins to melt. Hit it with a splash of mixer, not too much, and the drink will taste great. Too much mixer waters the drink down and your servers will have a hard time handling the drink without spilling. The sides of the glassware should always arrive at the customer DRY! Use them with style and keep the booze in the glass, not on bar mat. See Blog Entry "Pour Like You Mean It" from May 1st. It looks better and helps your pour cost. For a longer lasting head on beers that run flatter (not going to mention any domestic brands here...), pour 2/3 of the pint with "a little too much head", make another drink or two waiting for the head to condense, then come back to the beer and top it off with fresh beer and more head. Get a head on that thing and it not only looks niceer, but helps your pour cost too! It's also a nice thing if you're looking for your table servers to tip you out at the end of the night. Help them look good by being able to deliver attractive drinks to their table customers and they'll make more money, earning you a hopefully larger tip-out (if your crew does tip-out). Tip-out, if your unfamiliar, is when you tip your door man, chefs and bar-backs. They'll help you earn more money and will help you every time when you're in a bind. Believe me, if you're tipping them out, the next time you need something they'll be there for you. 8. Clean your space after you make every drink. Don't clean and you're one step deeper into the weeds. You'll look like a schlock and you won't be able to work as effeciently. 9. Glassware: NEVER touch the rim of the glass with your grubby mits. Yea, your grubgby, money-handling mits. Even if you just washed your hands, I don't want your fingers touching what I'm going to be drinking from, even if it's sanitary. It just doesn't look good. It's the same as sticking your fingers in my mouth. Beer glasses - if you see bubbles stuck to the side of a beer glass, that's a dirty glass. Clean the glass and pour beer into it again and you'll see for yourself - NO BUBBLES! 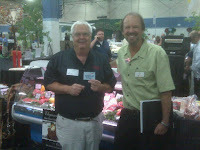 Greeting customers at the US Foodservice San Francisco 2009 Buying Show was Paradise Catering from Carmel Valley. 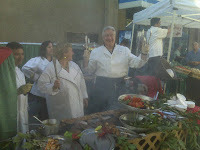 Jon Kasky and Nancy Rohan were at the grill from 7:30am-4pm cooking up Vande Rose Durok Pork, Superior Farms Lamb, Stockyards Angus Beef, Durham Ranch Skewers, Harbor Banks Seafood, and Cross Valley Farms Produce. The smoke and the aroma of mesquite barbeque from the grill could be enjoyed all the way from the parking lot at the Alameda Fairgrounds. Once inside the two buildings there was 4333 products on display. Everything from fresh meats, seafood, poultry, produce, dairy, desserts, beverages and frozen foods to non-foods, disposables, compostables, biodegradable products, canned goods, chemicals, and supply and equipment all on display. Customers were able to walk the show, tasting and talking to the manufacturers and broker reps responsible for the product. New menu ideas were conceived and seminars were held on buisness building ideas, menu design, marketing, and going green were held. 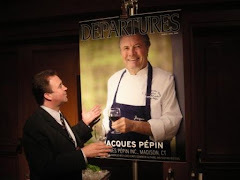 Dave Bates director of Street Sales for US Foodservice San Francisco said it was the most dynamic Foodshow that he had been associated with in his 25 years in the business. "It was obvious that customers were starving for ideas to grow their business." 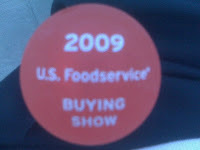 According to Michael J. Cala, Vice-President of Marketing for US Foodservice, it is very safe to say that they had over 700 customers attending and the Vendors made it quite clear that they sold more product than any other show ever! Many walked away with great new dessert ideas featuring Devonshire Desserts as well as the hot talk was around Hilltop Hearth Artisan – a new product line altogether! Vande Rose Farms made a splash with its premium Duroc Pork. And as usual, Stock Yards Angus was the talk of the town. "Our customer comments were the same way – they found incredible new ideas in areas to help them grow their business and were exposed to many of vale added ideas from our Resources Beyond partnerships!" 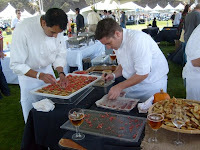 A local Chef from the Monterey Peninsula won a Wine Station from Napa Technology. Amomum (commonly known as black cardamom, brown cardamom, Kravan, Java cardamom, Bengal cardamom, Siamese cardamom, white or red cardamom) is distributed mainly in Asia and Australia. Both forms of cardamom are used as flavorings in both food and drink, as cooking spices and as a medicine. Elettaria cardamomum (the usual type of cardamom) is used as a spice, a masticatory, and in medicine; it is also smoked sometimes; it is used as a food plant by the larva of the moth Endoclita hosei. Food and drinkCardamom has a strong, unique taste, with an intensely aromatic fragrance. Black cardamom has a distinctly more astringent aroma, though not bitter, with a coolness similar to mint, though with a different aroma. It is a common ingredient in Indian cooking, and is often used in baking in Nordic countries, such as in the Finnish sweet bread pulla or in the Scandinavian bread Julekake. Green cardamom is one of the most expensive spices by weight but little is needed to impart the flavor. Cardamom is best stored in pod form because once the seeds are exposed or ground they quickly lose their flavor. However, high-quality ground cardamom is often more readily (and cheaply) available and is an acceptable substitute. For recipes requiring whole cardamom pods, a generally accepted equivalent is 10 pods equals 1½ teaspoons of ground cardamom. In the Middle East, green cardamom powder is used as a spice for sweet dishes as well as traditional flavouring in coffee and tea. Cardamom pods are ground together with coffee beans to produce a powdered mixture of the two, which is boiled with water to make coffee. Cardamom is also used in some extent in savoury dishes. In Arabic, cardamom is called al-Hayl. In Persian, it is called hel. In Hebrew, it is also called hel (הל). In Gujarati (a derivative of Sanskrit), it is "Ē-lī-chē". In some Middle Eastern countries, coffee and cardamom are often ground in a wooden mortar and cooked together in a mihbaz, an oven using wood or gas, to produce mixtures that are as much as forty percent cardamom. Black cardamom is sometimes used in garam masala for curries. 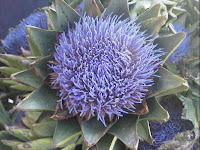 It is occasionally used as a garnish in basmati rice and other dishes. It is often referred to as fat cardamom due its size ('Moti Elaichi'). Individual seeds are sometimes chewed, in much the same way as chewing-gum. It has also been known to be used for gin making. I reduced the amount of sugar originally called for as the carrots are already quite sweet, but feel free to adjust the amount of sugar depending on your preference. Low heat and constant stirring of the carrot-milk mixture are key to the success of this dish to prevent the carrots from burning. 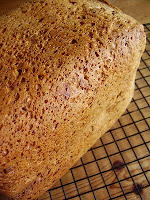 Check out the ‘Tips’ section in Jackie’s post for ideas on creating a vegan version. Heat the milk and the water in a heavy-bottomed pot (the water helps to prevent the milk from sticking to the bottom), stirring occasionally. When bubbles start to form on the surface, add the carrots and the cardamom and mix. Bring to a boil, then reduce the heat to its lowest setting, stirring every few minutes. Leave the pot uncovered during cooking to help the milk evaporate. Stir, stir, stir, until almost all the milk is evaporated, which should take between 45 minutes to an hour. When that’s done, stir in the sugar, butter and saffron and turn the heat up. Let the mixture boil, stirring as you do so, until all the liquid evaporates and you get a soft, orangey mush. Scoop into individual bowls, garnish with nuts and serve with vanilla ice-cream. Description: Whole caraway seeds are about 1/5 inch long, slightly curved and tapered at one end. The hard, brown seed shells have lighter colored ridges. This seed is a member of the parsley family and has a warm, sweet, slightly bitter, dill and anise-like flavor. Toast the caraway seeds in a small dry skillet over medium-high heat for 2 or 3 minutes, or until fragrant. Transfer to a small plate to cool; set aside. 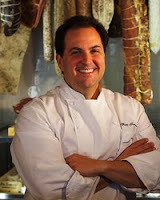 Chef Rick Tramonto To Join CLM? The venture now confirmed to be in the historic building that for years housed Stokes Restaurant and Bar. What's more, it appears CLM is looking to move into Cannery Row. Details are sketchy, and tied to leaked information, but it appears the project will be called the Cannery Row Brewing Co., taking over in the old O'Kane's Warehouse building that just saw the demise of Willy's Smokehouse. 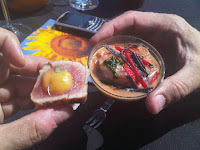 Nabbing Tramonto, named the "Best Chef: Midwest Region" by The James Beard foundation in 2002, is epic. Tune in this Monday, September 14, to see the Rachael Ray Show onWGN at 10 a.m. Central Time,sponsored in part by U.S. Foodservice and Monarch Food Group™. U.S. Foodservice and Monarch Food Group™ recently participated in the production of a special episode of Rachael Ray, the nationally syndicated talk and lifestyle television program. 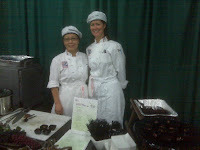 The show focused on how parents can prepare nutritious, affordable and delicious meals for children. Mark Eggerding, Senior Vice President, Street Sales, prepared several dishes for the program using fresh Cross Valley Farms® produce and may be featured on-camera in the show, which will air this Monday, September 14 on WGN at 10 a.m. Central Time. Be sure to tune in. 1 heaping teaspoon natural sugar or "sugar in the raw"
With a mortar and pestle grind the bay leaf with the sugar until the bay leaf is almost powdered. Place in a cocktail shaker with the vodka, lime juice, egg white, and sugar water. 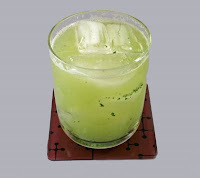 Shake with ice cubes and strain into an ice filled highball glass. Description: A whole leaf of the laurel tree, ranging from 1 to 3 inches in length and from 1/2 to 1 inch in width. The leaves are silvery-green in color and impart a flavor that is fragrant, sweet and aromatic with just a slightly bitter taste. 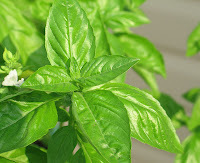 Description: A dried leaf of the basil plant, this product is one of the most popular culinary herbs. The flavor is rich with sweet, minty notes with a touch of anise-like flavor. Available in whole or ground form. Uses: Any Italian dishes, pesto’s, spaghetti sauces, tomato sauces, pizza, herbed bread, stuffing’s, cheese spreads, chicken, fish, beef, vegetables. 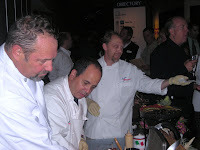 2009 US Foodservice Buying Show! Description: Arrowroot is a powdered starch from the arrowroot plant. It is a popular base for cream sauces and clear and delicate glazes, as it leaves a translucent appearance when it thickens. It is a substitute for cornstarch. Both arrowroot powder and cornstarch are starch thickeners, powders used to give body to pie fillings, puddings, gravies and sauces without adding their own flavor. But they each have their pros and cons. Arrowroot is a good thickener for an acidic liquid. (Cornstarch loses potency in acids.) Arrowroot is also a good choice if your sauce is mildly flavored. It holds up well to freezing, which cornstarch does not. When you're looking for a high-gloss finish, use arrowroot. On the downside, it's more expensive than cornstarch, and it's not a good choice for sauces or gravies with dairy products: They turn slimy. To thicken with arrowroot powder: Mix it with an equal amount of cold water and then whisk it into your hot liquid for about 30 seconds. Have I ever told you the story about the cowboy hat? We had a meat specialist that went to help out at the Alliant Foodservice Texas Foodshow and when he came home he dropped his expense reports for his rental car, room, drinks he bought for customers, and an expense for a large 10 gallon cowboy hat. The Marketing director (his boss) kicked the hat report back to him and told him it was frivolous and uneccessary for the show. In other words "the hat was on him". The next month the meat guy came in with a huge stack of expenses, coffee for customers, parking, tolls, postage, lunches, dinners, and more. He drops the thick stack on Marketing Directors desk and turns to walk out. When he got to the door he did a half turn and said "Marketing Director Guy? See if you can find the hat." The point of that story to me is that every distributor has a minimum expense to do business and they have to pass on those expenses one way or another. So your pork ribs, chicken breasts, and pink detergent may be amazing prices, and every distributor may be fighting to the penny to get you the best price, but you better watch the sugar packets, the foil, and (what was that other one I found..um oh ) spiced Chili Beans! I recently did price comparisons at two restaurants and the $11.00 box of sugar packets from my competitor was $30.00, and the $22.00 spiced beans were $44.00-but boy the competitor got me by a penny on the chicken breast that week!! Which leads to the next point, don't get so hung up on the pennies that you are missing the dollars. Call me about a Prime Vendor program that you can trust. Although spices represent less than 1% of food cost, they account for about 75% of the flavor! For less than a few cents per serving, Monarch Spices provide added flavor and increased value. Monarch sources over 100 products including over 30 seasoning blends from Global sourcing partners, ensuring a consistent product with no seasonal variability! It's been a couple of months since produce expert Bill Fujimoto parted ways with his family business, Monterey Market in Berkeley (1550 Hopkins St.). But Berkeley's loss is Lafayette's gain - Fujimoto is consulting with Diablo Foods (3615 Mount Diablo Blvd.) to strengthen the market's produce section. The National Honey Board is pleased to announce its second year of support for Minor League Baseball, tying in the natural energy boost of honey with America's favorite summer pastime. The ballpark of each sponsored team will feature honey-related signage, honey and energy messaging on the electronic billboards, honey night activities, and between inning contests promoting the honey and energy message. At every home game for each of the teams, we will once again feature the National Honey Board's "High Energy Play of the Game," where announcers will highlight an outstanding play made by one the players. 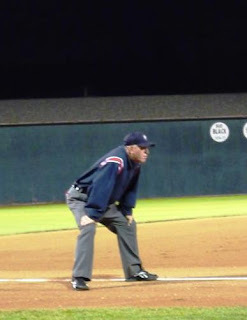 Senior District Manager of US Foodservice San Francisco and baseball umpire was on hand this year at the Babe Ruth World Series played at Story Field on the campus of Lower Columbia College in downtown Longview Washington. 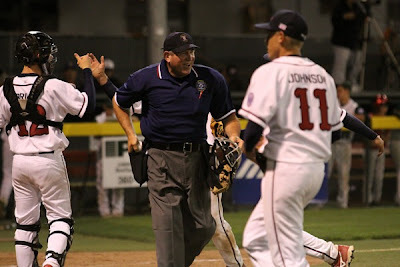 Read more about the partnership a the National Honey Board /Baseball website. As I walked into Montrio Bistro I found Chef Tony Baker at the Bar doing paperwork and Bartender and Craftsman in the kitchen pitting cherries. 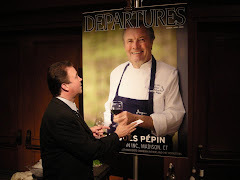 Chef Tony Baker said it was "impressive to see a man so dedicated to the art and science of a cocktail. 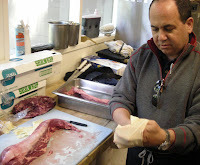 The time and effort that Anthony put into his ingredients is seldom matched." "As with anything, freshness counts," says Anthony, and this week he was certainly backing up his words as hit pitted, marinated, and jarred Maraschino cherries. Adapted from a NY Times Recipe. internal temperatures (instant read thermometer) for medium rare. Remove and tent with aluminum foil for 15-20 minutes. 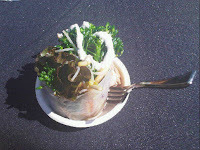 Heat olive oil, fry shallots for 3 minutes or until golden to dark drown, set on a paper towel to remove excess oil. Reduce one bottle of Zinfandel to 1/2 cup, add Demi Glace and bring to a boil, turn off heat and whisk in the two sticks of butter. Slice Tenderloin onto a platter, cover a little of the meat with the sauce, sever the rest on the side. Damaged crops from India to Brazil mean the world will not have enough sugar for a second successive year. The sugar price has surged 88% since January 1, 2009 last week reaching its highest since April 1981. Parts of Brazil, the largest grower, have been drenched by rainfall four times more than normal, making the crop too wet to harvest. India, the biggest consumer, had its driest June in 83 years and might have to double imports. Global demand will exceed output by as much as 5-million tons in the year to September next year, leading to a record two-year shortfall, according to the International Sugar Organization in London. Celebrate September! National Honey Month and National Breakfast Month share the limelight. For a unique breakfast treat, set up a self-serve biscuit or oatmeal bar. Begin your array of tempting toppers with honey, honey butter or another of the Honey Board's tasty breakfast toppings and spreads.